The autumn brings us a respite from the dog days of summer, beautiful changing leaves, and pumpkin spice everything. However, it also brings with it the "fall flea surge". Whats this? Well, recent studies have shown that fleas thrive in the fall. This is largely due to the increase in precipitation and the temperatures that often hover in the low 70s (which is the ideal temperature for fleas). 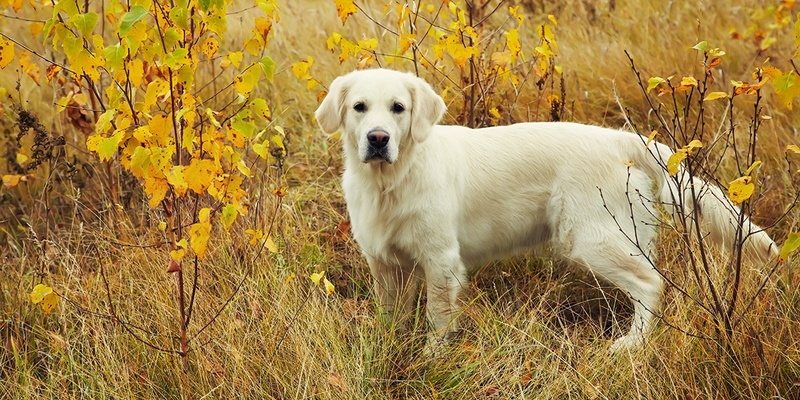 In fact, it has been found that the number of fleas found on animals in the fall months are actually 70 percent higher than those in the spring! 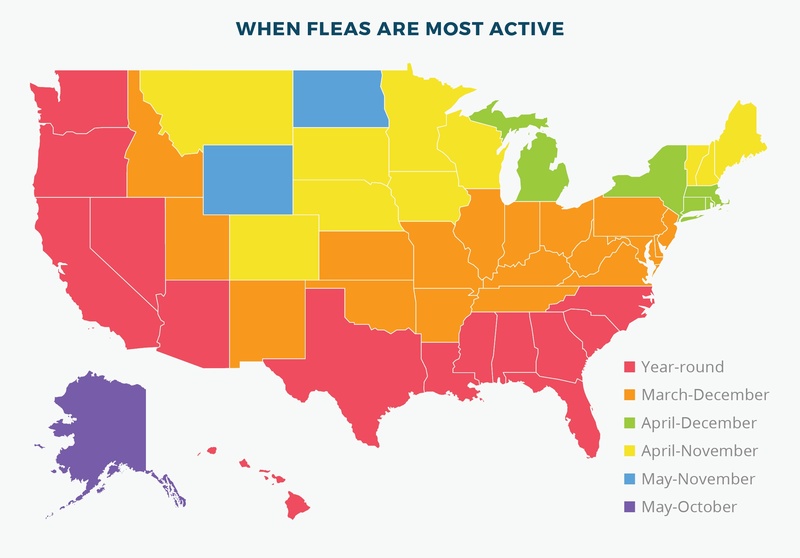 Here is a map that better demonstrates when fleas are the most active. There is also a great (and free!) infographic at the bottom of this article to hang in your store. Help Boost Your Fall Flea Sales! Help inform your customers about year round flea control with this free infographic. Hang it up at your register or display case! Knowing exactly what months flea season is during will make it easier to help customers looking for assistance this fall. Since many people are on top of providing their pet with preventative treatments in the spring and summer they may not know how to handle a full blown flea infestation unexpectedly. Topical Treatments: Medications to be applied to your pet's skin, usually at the base of the neck or between the pet's shoulder blades. The treatment spreads over the pet's whole body by depositing into the sweat glands. The active ingredient will be released over time, generally several weeks, and will continue to work even if a pet is bathed or swimming. Oral Medications: For pet parents who do not want to apply a topical treatment to their pet's skin an oral medication is a good option. Some products even offer treatment for fleas, ticks, heartworm disease and even some internal parasites like roundworms, hookworms, and whipworms. Nasty little buggers. Sprays/Powders:;This is a relatively inexpensive and effective method for controlling fleas and ticks. Some sprays and powders will be able to last a significant amount of time (sometimes up to several months) as long as the pet remains dry and the product does not get washed away. Powders should be dusted over the entire body and then rubbed into the fur and even between the toes. Shampoos/Dips:Flea and tick shampoos help to wash away fleas, larva and eggs for a short period of time, but will not keep pets protected from a returning infestation. A flea and tick dip is a concentrated liquid (usually pyrethrin) that is diluted with water than applied to a pet's coat with a sponge or by pouring over the body. The dip is not immediately rinsed off, but is allowed to air dry before. Collars: Flea collars use concentrated chemicals to kill and repel fleas and ticks. The chemical will disperse through the collar over the animals body often for several months. For customers looking for a budget friendly option flea and tick collars are often relatively inexpensive. 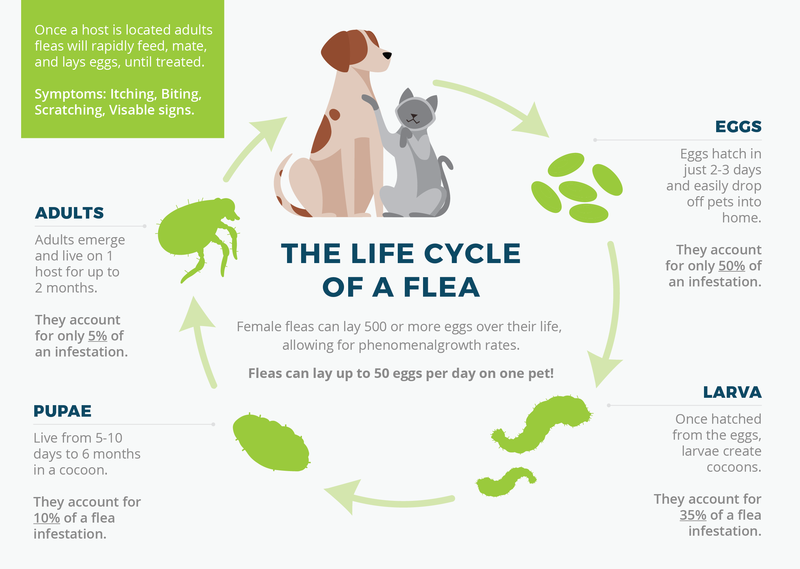 Understanding the flea life cycle can help you drive home the importance of treating your home as well as your pets. Remove and wash all bedding. Flea pupae have a sticky coating that will embed themselves in the fiber of your bedding so washing with hot water will remove them. Thoroughly vacuum all carpets and rugs. You must make sure to change the vacuum cleaner bags after each time you vacuum. It may also help to brush or scratch your carpets before vacuuming so you can make sure that you are dislodging all fleas and flea pupae. Use a flea powder. Sprinkle powder along the perimeter of the walls, cover your floor area with it, and inside sofa cushions. Let the powder sit for at least one hour before vacuuming and if the infestation is really bad you can let it sit for up to 24 hours. Powders can also be used to treat your yard. Try using a fogger or flea bomb. If the infestation is really severe you can use a fogger to treat your home. A fogger also known as a flea bomb is an aerosol canister that releases insecticide into a room. You would need one for each room in your home. Foggers are usually toxic so you and all your pets would need to leave the home for at least two hours when in use. Make sure to protect surfaces with newspaper and TURN OFF pilot lights because they are flammable. Even in cold weather, fleas can survive in many places, including underground in burrows, in sheds and outbuildings, under decks and around foundations — where the temperatures, food supply and overall conditions are sufficient to maintain a population of reproducing fleas. So, don't take down your flea and tick display just yet because customers will still be looking for product. Even though time spent outside reduces significantly as the temperature drops, fleas and ticks can easily make their way into the home on clothing and other items, so be sure to use preventative flea and tick care all year round. It’s important to remember to treat the environment as well as your pets. What's your preferred method of flea and tick treatment? How do you keep your customers informed? Let us know in the comments below!